I’ve been researching and treating chronic pancreatitis for decades, so I know firsthand what a complicated disease it is and how many unknowns remain. Answers are finally beginning to emerge, but the research is still very preliminary, underscoring how much more we need to learn. It has become increasingly clear that chronic pancreatitis (CP) is caused by multiple factors. Those factors vary from patient to patient and in how they interact with each other. 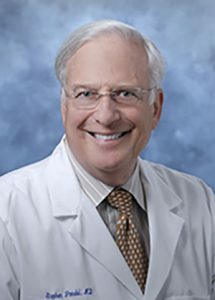 Stephen Pandol, MD, is Director of Basic and Translational Research at Cedars-Sinai Medical Center and Professor of Medicine, University of California Los Angeles. His career has been devoted to understanding the mechanisms of pancreatic diseases, both inflammatory and malignant. As a scientist, I’m worried by the continued misunderstanding of the etiology of chronic pancreatitis. As a clinician, I’m troubled by the often-tragic effects this has on CP sufferers. The focus on drinking and alcoholism stigmatizes pancreatitis patients and prevents them from getting the best care. Patients are counseled to “just quit drinking,” advice that is as inappropriate as it is insensitive. Parents of pediatric patients are accused of giving their children alcohol. Conversely, light drinkers or nondrinkers receive incorrect or delayed diagnoses. The beliefs about alcohol’s role have also gotten in the way of developing effective treatments. If you’re a CP patient, you probably know all this. I’ve seen it with my own patients over the years: the suffering of the disease is compounded by frustration at the lack of treatment options. It’s a terrible mix that leaves many patients debilitated, discouraged, and depressed. Unfortunately, most people—including most doctors—cling to an outdated, one-dimensional view: that CP is caused by alcohol. This belief is constantly reinforced by the media. We’ve seen this recently in coverage of the suicide of Swedish DJ Avicii, which often links his pancreatitis to heavy drinking. Fortunately, a small group of determined researchers has begun to untangle the causes of CP and put the role of alcohol in better context. Advances in genetics have played a huge role. Precision medicine—tailored to particular combinations of genetic, environmental, and lifestyle conditions—is an exploding area of research, and chronic pancreatitis is a natural target. Because CP is so complex, we needed these developments to get a better handle on it. New science has also shifted our approach. For a long time, research focused on the fully diseased pancreas in long-term chronic pancreatitis. But now we’re looking at the process of reaching that stage of disease. This not only helps us better understand CP’s progression; it will also help us find therapies for earlier stages of the disease. In general, drinking must be very heavy to show an association with chronic pancreatitis: Only very heavy drinking—four or five drinks a day over a prolonged period (five years)—appears to be associated with the onset of CP. Even among people who drink that amount, only about 3 percent develop pancreatitis. Genetic factors appear to be linked to alcohol-induced chronic pancreatitis: In that small group of heavy drinkers who develop CP, genetic alterations appear to be involved. The mechanisms of alcohol-induced pancreatitis are complex and involve disorders of both the acinar cell and ductal cells of the exocrine pancreas. Tobacco use is an even greater risk factor than alcohol use: Evidence increasingly points to tobacco as a risk factor; it is also associated with progression of the disease. Tobacco appears to inhibit a protective pathway in acinar cells. These are important findings, but the new wave of research is still in its early stages. And the group of scientists exploring these issues remains relatively small. We need more attention to this disease, and more collaboration. We need to collect and analyze more information on alcohol, genetics, and other factors that influence the symptoms and progression of CP. Determining the potential role of genetics in the formation of the disease. Patients should encourage their doctors to obtain genetic testing as treatments are being developed. Analyzing a wide range of information (including genetics) from pancreatitis patients to understand the many factors involved in this complex disease, which will lead us to treatments that might not otherwise have been considered. Conducting pilot clinical trials based on already approved drugs that attack the disease mechanisms that drive or contribute to chronic pancreatitis. Creating, developing, and testing the next generation of therapeutics directed to specific molecular pathways. I’m working with researchers on all of these fronts. We are fortunate to have Mission: Cure behind us. Its innovative financing model will jumpstart these early advances and move us more quickly toward the goal we all share: finally delivering effective treatments and better outcomes to chronic pancreatitis patients. Sign up to receive updates from Mission: Cure delivered straight to your inbox, and learn about our efforts to end chronic and recurrent acute pancreatitis.